Wilber came to Out of Africa Wildlife Park from an animal facility in Florida as a rescue. Wilber lives with Wilma, his mate, in a large habitat shared with other species, such as marmoset monkeys, lemurs, and exotic birds. Sleeping most of the day, he is occasionally active during daylight. Those daylight encounters reveal Wilbur’s gentle and friendly nature. On some occasions, arboreal species will visit the ground below. However, we have never actually witnessed Wilber touching the ground since he’s lived here, proving that what goes up does not necessarily come back down. 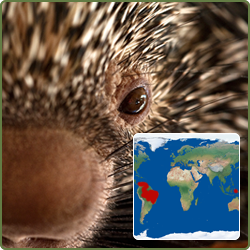 Sometimes referred to as coendous, the prehensile-tailed porcupines are primarily found in Venezuela, Guiana, Brazil, Bolivia, Paraguay, Trinidad, and extreme northern sections of Argentina. They inhabit tropical forests at elevations up to 8,000 feet. Prehensile-tailed porcupines are thought to be similar to North American porcupines in that they tend to have individual territories. Females have exclusive territories, while the males often have territories that overlap and may vary widely in size. The compact body is covered with short, thick spines mixed with short hairs, that range in color from brownish-yellow to nearly black, while the underside is grayish. The quills can lie flat or be erected if the porcupine is disturbed. Their head is small and their nose is round and bulbous and covered with short fine hair but no quills. The lips and nose are fleshy. The long tail is prehensile, with the tip curling upward so as to get a better grip on tree branches. The porcupine can grow between 24 to 40 inches long, but roughly half of that is tail. They use their tail as an extra hand to help them hold on to branches when climbing through the forest canopy. The last third of the tail is spineless, providing the animal with a better grip. Porcupine feet are reflective of their arboreal lifestyle, well-adapted for gripping branches, with four long-clawed toes on each foot. These limbs make them adept climbers, an adaptation to living most of their lives in trees. Weighing an average of 9 pounds, they have an excellent sense of smell, although their vision is somewhat poor. The mother prehensile-tailed porcupine will give birth to a single baby after a 203-day gestation period. Females can mate as soon as young are born. Weighing less than a pound at birth, babies are born year-round with reddish hair and soft quills that harden in about a week. They are born with their eyes open and able to climb within a few hours of birth. The youngsters are weaned at 10 weeks and will reach sexual maturity in about 1 ½ years. A typical lifespan is between 14 to 17 years. Principally nocturnal and arboreal, prehensile-tailed porcupines spend their days sleeping in hollows, tangled vines, and upper limbs of trees above the forest floor. They forage for food at night. They rarely drink water because they obtain all they need from their diet. This shy animal rarely descends to the ground, but it shows little fear if it happens to be caught. It is not aggressive but will defend itself ferociously if attacked. When confronted, a porcupine may stomp its feet and shake its quills, which makes a rattling noise. Adults are slow-moving and will roll into a ball when threatened and on the ground. Contrary to popular belief, their barbed quills are not shot out at predators but instead release easily when the porcupine is tense. The prehensile-tailed porcupine can be solitary or live in pairs in the branches of trees. In the wild its primary diet consists of fruits, flowers, leaves, twigs, shoots, and the inner bark of trees. At a zoo or safari park a typical diet involves fruits, root vegetables, and fiber biscuits. These porcupines, like others in their family, have a gland near the base of their tail which secretes hormones used to mark their territory. They have been observed displaying unusual courtship behavior, such as rubbing noses and dancing on their limbs. Porcupine comes from the Latin porcus for pig and spina for spine: “spiny pig.” Porcupines, however, are not related to pigs. Prehensile-tailed porcupines are used as food in many parts of South America. They have a keen sense of touch, hearing, and smell. Porcupines are the third largest of the rodents, behind the capybara and the beaver. Porcupines are not currently endangered, although habitat destruction affects them adversely. The International Union for Conservation of Nature (IUCN) classifies its status of least concern.